You have a great website with wonderful up to date information. 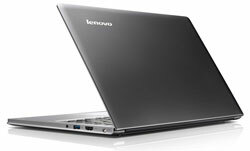 I am sure the 13” Lenovo® IdeaPad® U300s is # 1 too!!! MY SON BIRTHDAY IS JAN.30,2012 HE WILL BE 15YR. OLD AND HE WORK SO HARD @ SCHOOL AND @ HOME I REALLY THINK HE HAS EARNED IT AND HE DESERVE THIS LAPTOP. I need the Lenovo Ultrabook because my current laptop is old, big, heavy and the battery won’t hold a charge. Please….my computer is old and, and, and…. What better way to work smarter than with a new Ultrabook? It’s 1.6GHz Intel Core i5 processor, 128 GB solid state drive, and 8 hours of battery life, in addition to its sleek more portable design would help me tremendously in keeping my New Year’s Resolution-to achieve a better balance between home and work (which consists of 2 jobs). Thanks for this opportunity! I travel a lot for my job and I wouldn’t have to carry around this heavy, bulky, HP anymore! We travel a lot for work and this would be great to keep in touch with the family! I would love to win the Lenovo….My lap top is so HEAVY it hard to move carry it around!! My desk top computer is about ready to die. I need a new one but can’t afford one, so would like very much to win this one. My old Lenovo, while a workhorse, has done its part and needs to be retired! as some of the other entries. Please give it to the teacher or the grandson or the disabled dad. Thanks. It would be great to get a new laptop to do my work on. My current one is quite old and clunky. I never win anything. A nice, shiny new laptop would be nice! Thanks! I am a 59 yr old grandma who lives with my elderly parents, taking care of them as their dementia changes them almost before my eyes. Additionally, I have recently gained custody of my 10 year old grandson (the oldest of my nine grandchildren). Winning the Lenova Ultrabook would be an awesome and amazing thing for me; I would use it to access the internet where I have recently begun to blog as a means of expressing my observations of life as caregiver to different people and in different situations in my life (like reflecting on the three weeks my brother was in Hospice before passing away this past October). I would also be able to use it keep in touch with my facebook pals, as well as keep track of my book sales on half.com and set up listings on eBay, to further supplement my income. All in all, it would be a huge help to me and I would love to win it! We’re a small family, but, we have a teenager who constantly needs to get on the computer—homework, facebook, etc. The adults need a computer to use of their own! Christina - xristya@rock.com - I’m a subscriber, and I need a new Lenovo Ultrabook because I have only an old laptop that I use to write music, movie and book reviews on the web, besides my own creative work in poetry and fiction. The Lenovo Ultrabook would go beyond my wildest expectations! My 10 year old PC is on its last leg and I am desperately trying to eke out a couple more months of use. This would be such a miracle. Here’s hoping! I need an Intel powered Lenovo Ultrabook because my computer is OLD as dirt! What an AWESOME looking computer!! Would be a great asset to anyone but I sure would love to be able to travel with it for my hobby of genealogy, my Passion in life!!! Very difficult to take a desktop with you!!! Please give me the Ultrabook!!!!! I need a new Lenovo ultrabook, because of the light weight and blazing speed. Ok, the beautiful copper colored finish will make me look good just sitting still. First and foremost, love new technology!!! Would love the conveniences of the size and lightweight ease of handling it while out and about!Please pick me!!! I sure could use the Lenova, my daughters laptop crashed and she now has mine. If I won this she could keep the old one! make us both Happy!! I need this because i’m cool and so is the machine. I could use a laptop to get connected with my children & grandchildren who are all on-line daily. It would also fill the void left from not having to go to work. Starting my own business and it would be great to be able to work at home instead of at the library. I would love a new Lenovo Ultrabook, because I currently have a 3-year old 9” Acer that I take with me to science fiction conventions to blog. Would love to have an updated thinner and lighter computer! I could use a laptop to replace my slowly dying desktop that is 10+ yeafs. I have a 10” notebook which is not able to burn cds. I love Christian Music and would like to burn some cds. I need this new laptop because my old laptop was what I got from my ex-husband. I have a new life now, and this laptop crashes constantly and the cord is wearing out. The battery is already dead, and I believe it’s dying a slow death. I REALLY need a new one, and would absolutely love to win this!! Thanks! I really need a laptop but it’s not in the budget right now. This would make my job so much easier!! My daughter starts college this fall and really needs a good computer for college! I lug my laptop with me everywhere and it’s so heavy and bulky it’s killing my back! Right now all I have is a desktop. An ultrabook would be nice. Why???? Why wouldn’t I need one???!!!!! I work on second shift so I rarely have time to sit at the computer at home and catch up and do personal work. This Lenovo would allow me to work/catch up anywhere! My son is going off to college next year and he needs a new laptop! I have never owned a laptop andcan’t afford one since I am unemployed. Would be great to find a new job on it. I would love to have this and try to expand my home business. Also, I want to go back to school and I would like to have this to take with me. I’m a teacher and use my laptop for so many things - at work and at home. It’s getting old, though - bought it back when Bush was still the president. I’d love it if I could win a nice, new one! I need a Intel-powered Ultrabook because my old laptop died last year and I haven’t been able to afford to buy another one. Especially one this nice! I love Lenovo! Mine is getting a bit old and I would love to throw my boyfriend’s dell away and replace it with a Lenovo. My 19 year old daughter says I need this “cause you’re super baller”. Don’t know about that, just know I would love to have a laptop to do all my “business” and perhaps play a little.